Caption slip reads: "Photographer: Mack. Date: 1957-05-01. Reporter: Thackrey. Assignment: Polio Shots. 26: Eliza Ruiz holds her son, Melvin, 1, in her arms to get polio shot at Central clinic. Ruiz family lives at 1065 Sunset boulevard. Beth Ellen Miller, 4, nearly loses her chewing gum as she gets a shot from Dr. Maude Hilliard at central clinic. Holding her is her mother Mrs. Arlene Miller of 10377 South DeVilla, Whittier. 50 and 51: Dr. Maude Hilliard, physician at the Los Angeles Health Dept. Central Clinic, gives polio booster shot to Rachel Hermosillo, 21, of, 613 South Fraser. 33: Mrs. Doris Cloud, R.N., fills syringe with polio serum while line, background , is inoculated at central clinic. 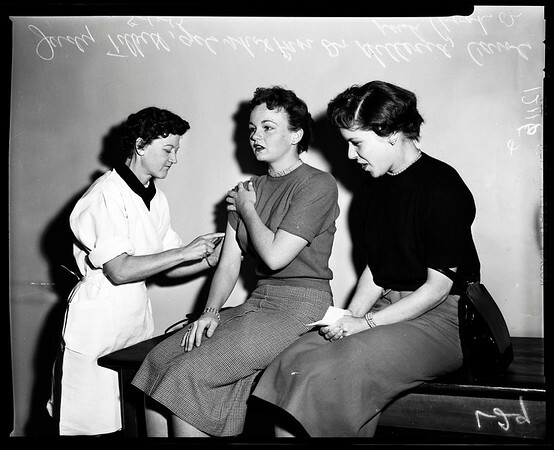 29: Judy Tibbett, 16, of 8520 Trask, Playa Del Rey, gets polio shot from Dr. Hilliard, while friend Carole Lusk, 17, of 6425 Will Rogers drive, Westchester (right) looks on".